Like most local Amateur Operatic societies, we are a group of enthusiastic singers, dancers and technicians who spend their spare time striving to produce shows that are as near 'professional standard' as we can make them! We are very lucky to have been able to use the services of the same superb director/choreographer, Louise Denison, and equally wonderful musical director, Jim Lunt, for the past 20-odd years, and their professionalism has helped us achieve our goals. We have a small, hard working committee and a core of faithful supporters. Our auditions often attract performers from as far afield as Wakefield, York, Leeds and Huddersfield, but we especialy love encouraging local talent. If you would like to join us, please get in touch - we'd love to hear from you! 2019 sees HSAP celebrate it's 50th birthday, and we plan on doing it in style! 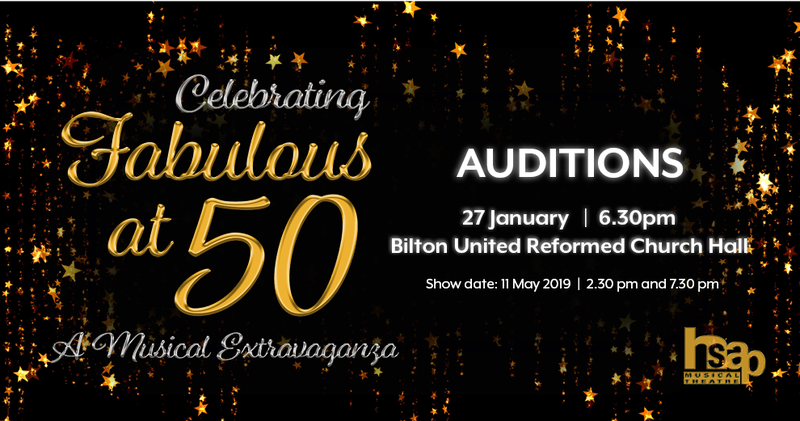 On Sunday 27th January we will be holding auditions for our Fabulous at 50 concert. We're on the look out for a fabulous cast who will join us in paying tribute to the productions the society has staged over the last 50 years. From "Carousel" to "Chicago", "Footloose" to "Fiddler on the Roof", "South Pacific" to "Sound of Music", "High School Musical" to "Hairspray" and "West Side Story" to "Wizard of Oz" ... there is something for everyone. The evening performance will be followed by a party to top of the evenings entertainment. You can now book your tickets here! Interested in keeping up to date with our latest shows and events? Simply provide us with your name and email address below and we'll add you to our mailing list so you'll be among the first to hear what's in the pipeline!